Previous PostCongrats Jennifer & Scott Smith!Next PostReflections featuring the Father of the Bride! We love filming testimonial films for corporations and or nonprofit organizations. We also love wedding filmmaking. 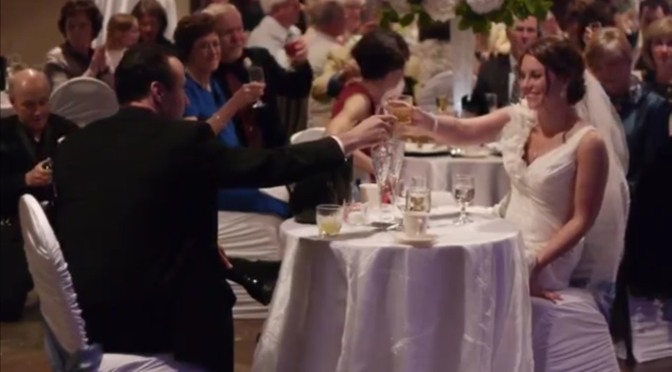 Having your wedding professionally filmed is one of the most rewarding decisions you will make. Just imagine reliving your special day over and over. You will be amazed at all the little details we capture on HD film that you would have forgotten due to the natural swirl of events and activities surrounding your wedding and reception. It is as close as it comes to actually being there. In addition, you can show mom and dad just what they got for the money. L.C. Media, Inc. pledges you excellence in service and professional quality for both event cinematography and corporate media. My wife Mary and I have been producing event media for over 20 years. I have a master’s degree in cinematography and a PhD in Communication and currently serve as the Associate Dean of the Arts at Huntington University. For the past 5 years we have been voted “Best Videography” in the Fort Wayne Journal Gazette’s Readers Choice Awards. You can be assured that we are using the leading edge in digital technology to capture your special day on HD media. Please call for a free consultation @ 260.760.5334. We look forward to serving you. Contact us by email lance@lanceclark.com or call 260-760-5334.